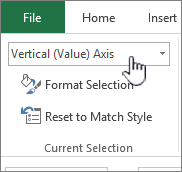 By default, Microsoft Office Excel determines the minimum and maximum scale values of the vertical (value) axis, also known as the y axis, when you create a chart. However, you can customize the scale to better meet your needs. When the values that are plotted in the chart cover a very large range, you can also change the value axis to a logarithmic scale, also known as log scale. To change the scale of other axes in a chart, see Change the scale of the horizontal (category) axis in a chart or Change the scale of the depth (series) axis in a chart. This displays the Chart Tools, adding the Design and Format tabs. On the Format tab, in the Current Selection group, click the arrow next to the Chart Elements box, and then click Vertical (Value) Axis. Important The following scaling options are available only when a value axis is selected. To change the number at which the vertical (value) axis starts or ends, for the Minimum or Maximum option, type a different number in the Minimum box or the Maximum box. You can click Reset to bring it back to its original value if needed. To change the interval of tick marks and chart gridlines, for the Major unit or Minor unit option, type a different number in the Major unit box or Minor unit box. You can click Reset to bring it back to its original value if needed. To reverse the order of the values, select the Values in reverse order check box. Note When you change the order of the values on the vertical (value) axis from bottom to top, the category labels on the horizontal (category) axis flip from the bottom to the top of the chart. Likewise, when you change the order of the categories from left to right, the value labels flip from the left side to the right side of the chart. To change the value axis to logarithmic, select the Logarithmic scale check box. Note A logarithmic scale cannot be used for negative values or zero. To change the display units on the value axis, in the Display units list, select the units you want. To show a label that describes the units, select the Show display units label on chart check box. Tip Changing the display unit is useful when the chart values are large numbers that you want to appear shorter and more readable on the axis. For example, you can display chart values that range from 1,000,000 to 50,000,000 as 1 to 50 on the axis and show a label that indicates the units are expressed in millions. To change the placement of the axis tick marks and labels, under Tick Marks, select any of the options in the Major type or Minor type boxes. Click the drop down box under Labels and choose a label position. To change the point where you want the horizontal (category) axis to cross the vertical (value) axis, under Floor crosses at, click Axis value, and then type the number you want in the text box. Or, click Maximum axis value to specify that the horizontal (category) axis crosses the vertical (value) axis at the highest value on the axis. Note When you click Maximum axis value, the category labels are moved to the opposite side of the chart. To change the number at which the vertical (value) axis starts or ends, for the Minimum or Maximum option, click Fixed, and then type a different number in the Minimum box or the Maximum box. To change the interval of tick marks and chart gridlines, for the Major unit or Minor unit option, click Fixed, and then type a different number in the Major unit box or Minor unit box. To change the placement of the axis tick marks and labels, select any of the options in the Major tick mark type, Minor tick mark type, and Axis labels boxes. To change the point where you want the horizontal (category) axis to cross the vertical (value) axis, under Horizontal axis crosses, click Axis value, and then type the number you want in the text box. Or, click Maximum axis value to specify that the horizontal (category) axis crosses the vertical (value) axis at the highest value on the axis. On the Format tab, click Vertical (Value) Axis in the dropdown list and then click Format Pane. To change the number at which the vertical (value) axis starts or ends, for the Minimum or Maximum option, type a different number in the Minimum box or the Maximum box. You can click the Reset arrow to bring it back to its original value if needed. To change the interval of tick marks and chart gridlines, for the Major unit or Minor unit option, type a different number in the Major unit box or Minor unit box. You can click the Reset arrow to bring it back to its original value if needed. Under Axes, click Axes > Vertical Axis > Axis Options. Note: Depending on the chart type, some options may not be available. To change the number at which the vertical (value) axis starts or ends, for the Minimum or Maximum option, type a different number in the Minimum box or the Maximum box. To change the interval of tick marks and chart gridlines, for the Major unit or Minor unit option, type a different number in the Major unit box or Minor unit box. For a vertical axis, you can add and position the axis on the top or the bottom of the plot area. Note: The options may be reversed for bar compared column charts. Under Axes, click Axes > Vertical Axis, and then click the kind of axis label that you want. When a chart displays a secondary vertical (value) axis, you can also change the scale of that axis. For more information about displaying a secondary vertical axis, see Add or remove a secondary axis in a chart. XY (scatter) charts and bubble charts show values on both the horizontal (category) axis and vertical (value) axis, while line charts show values on only the vertical (value) axis. This difference is important in determining which chart type to use. Because the scale of the line chart's horizontal (category) axis cannot be changed as much as the scale of the vertical (value) axis that is used in the xy (scatter) chart, consider using an xy (scatter) chart instead of a line chart if you have to change the scaling of that axis, or display it as a logarithmic scale. After changing the scale of the axis, you might also want to change how the axis is formatted. For more information, see Change the display of chart axes.